Our hens are vibrant and active ladies that spend their days comfortably socializing, laying eggs, foraging, grazing, eating, drinking, swallowing grit, roosting, investigating excitement among other hens, and relaxing as desired. Above: A restored cotton module builder converted into laying hen shelter for our certified Humane, Non-GMO, pasture-raised laying hens. Above: An aerial photograph of our pasture-raised chickens in our Indigo Pasture. 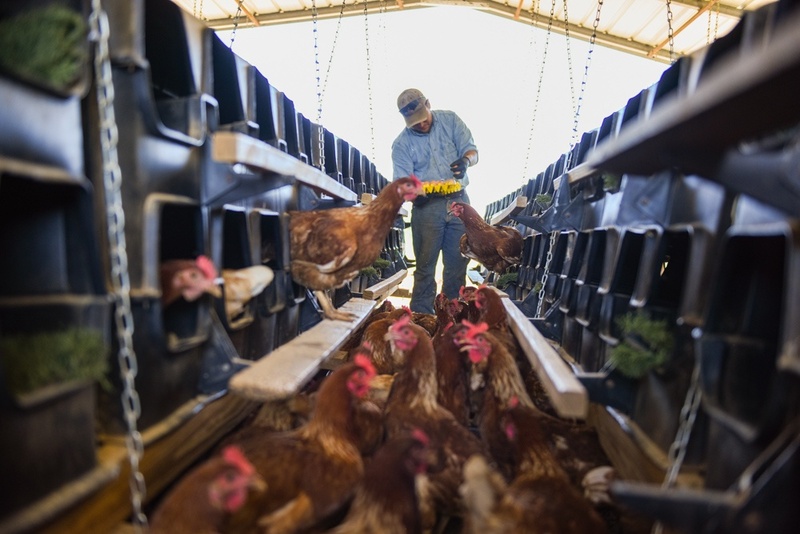 We have several laying hen breeds we use, but mostly NovoGen and Hy-Line Brown. The NovoGen is a small, light bird (ideal for our humid climate) that produces an egg with a hard shell (perfect for transporting eggs across bumpy pastures). The Hy-Line Brown is a very reliable layer with excellent feed efficiency, and there is a hatchery here in Georgia, which enables us to pick up the chicks shortly after they hatch and place them in the brooder a few hours later. Inside one of our portable layer house nesting box houses. The hens lay inside the black boxes and our employees make sure that the astroturf and inside of the layer boxes is kept clean for hen health. 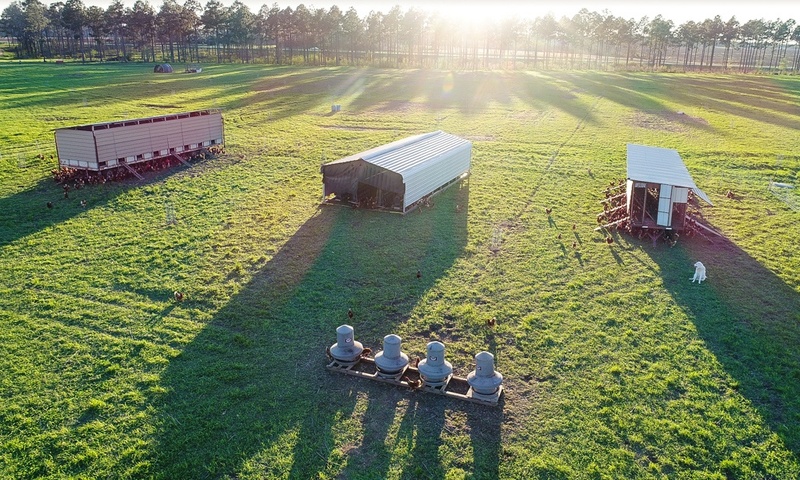 Three of our flocks are using old, retrofitted cotton wagons for roosting shelters, while two others use old, modified cotton module builders for roosting shelters. Our carpentry crew has done a fantastic job working with us to build roosting shelters that meet the needs of the birds. Each shelter solution that we use has its strengths. For example, it is advantageous to have a roosting shelter with no floor, allowing us to leave behind all chicken poop when we move the flock to a new paddock each week. The cotton module builders provide us the floorless advantage, while the cotton wagons have an expanded metal floor that catches about half of the poop. Ease of moving the shelter is also a consideration. The cotton module builders are very heavy and require a tractor to move, while the cotton wagons are light and easily moved with a truck. 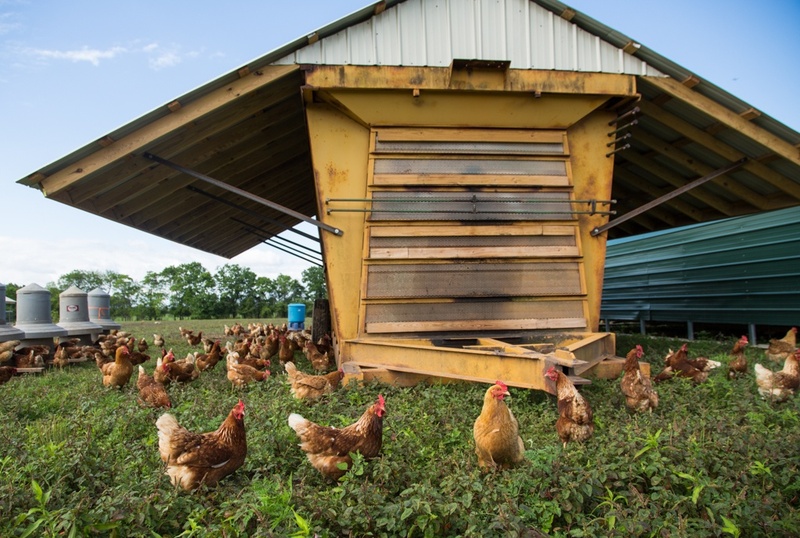 Our hens play a vital role in pasture regeneration while providing our customers with healthy eggs. We have water piped to each flock, allowing the hens to drink from water bells hanging from the roosting shelters. Hanging the water on the shelters makes it easier for us to move the flock, and allows the hens to drink in the shade. As noted, we move the entire 164’x164’ paddock each week (on Wednesday) to the next spot forward on the pasture. This is a good pace; the hens are kept with a supply of great pasture to graze, and the impact on the pasture is such that recovery is quick. 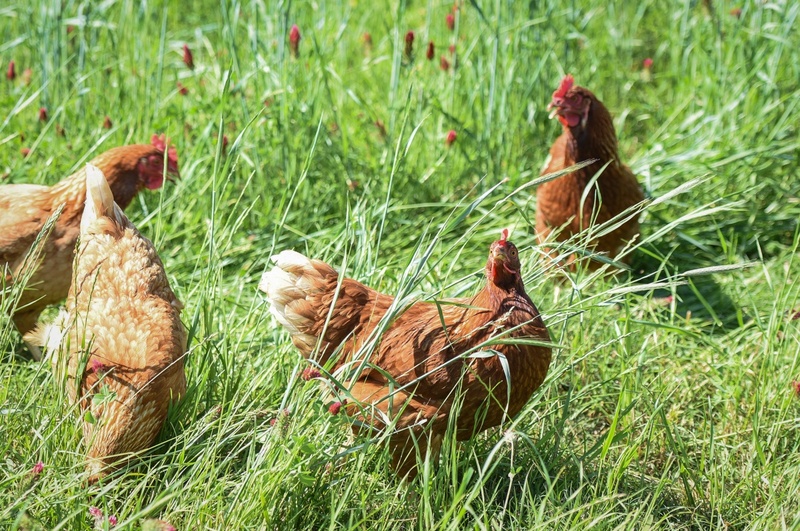 The pasture can tolerate a longer stay by the hens without incurring damage, but we are keen to keep providing the hens the choicest grazing options possible. 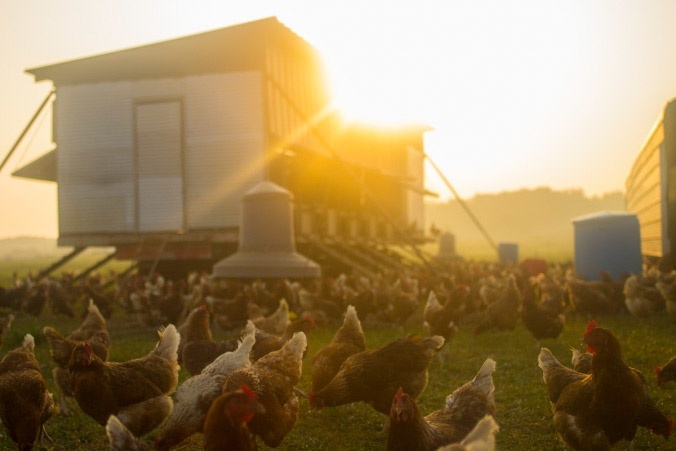 We provide the hens with supplemental nonGMO feed as well. 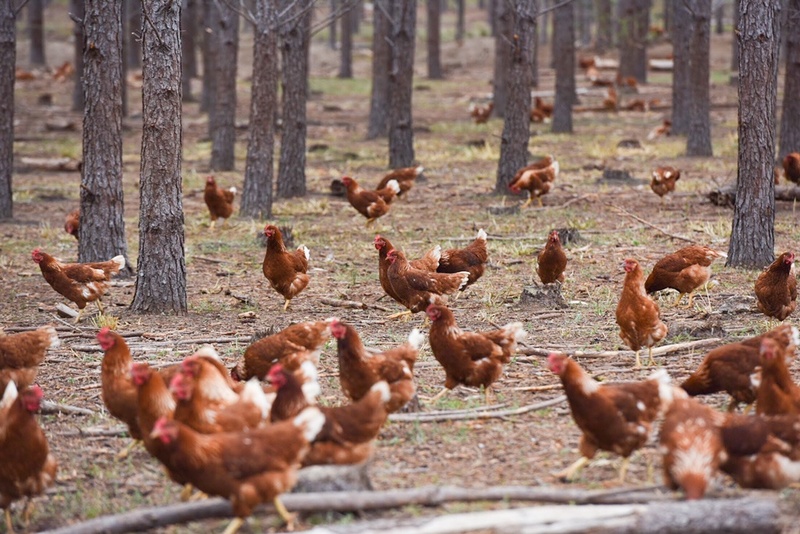 Our hens wandering through the shade of the planted pines which play a role in our silvopasture portion of our Serengeti model. Inside each nest box, where the hens lay their eggs, is a square of astroturf and a bit of pine shavings. This creates a space that the hens can manipulate a bit to help with their comfort. The pine shavings also help us keep the nest boxes clean - any poo that might have been left in a nest box is usually caught by the pine shavings and easily brushed off each day. A laying hen forages in the tall cool season grasses on pasture, looking for insects to supplement her diet. 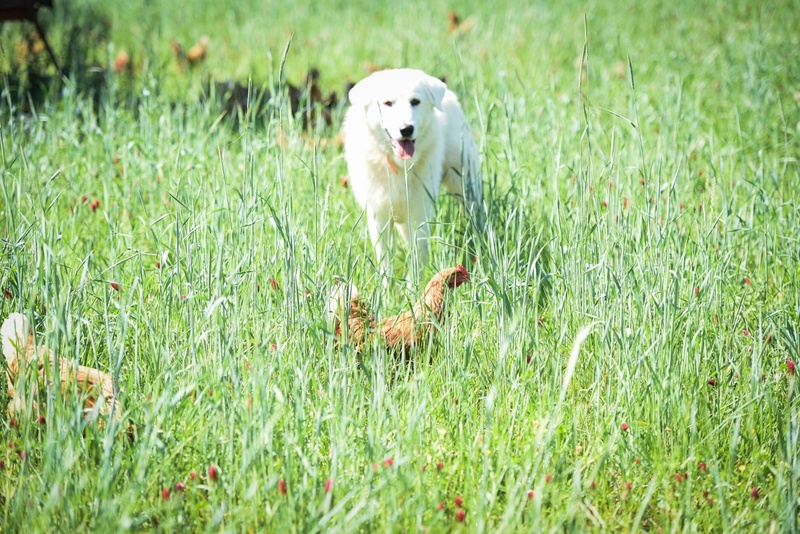 A laying hen walks past the livestock guardian dog who keeps her safe on pasture. 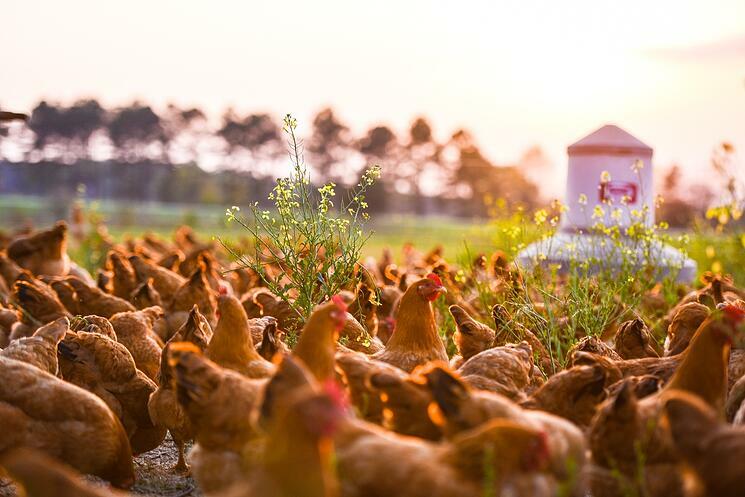 Our hens are fed nonGMO supplementary feed but they do a significant amount of foraging and grazing. 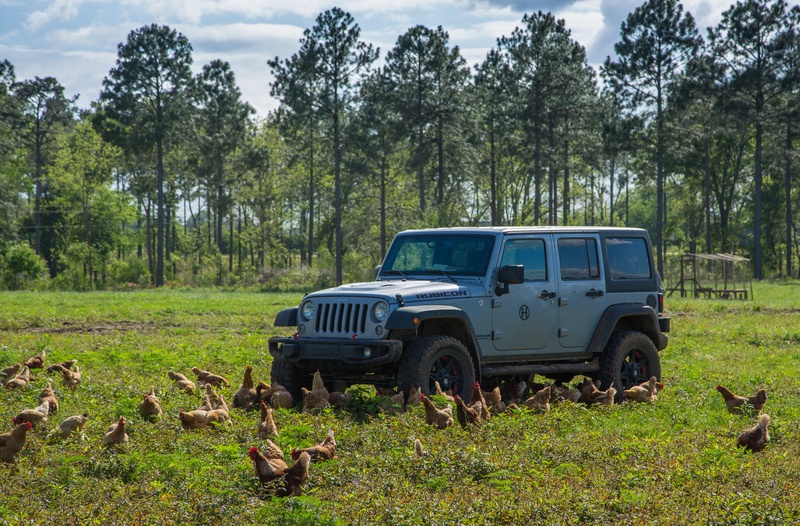 Inquisitive laying hens surround Mr. Will's jeep in the pasture.